Teaching requires knowledge of where students are. Students do not enter a classroom with a blank mind. The same is true for everyone - we all have knowledge - we have our own perceptions. Unfortunately, some of these perceptions do not agree with reality. Wrong perceptions can make us arrive at incorrect conclusions. When an erroneous perception is made as a premise, we can really be misguided. Take, for instance, how much we perceive ourselves as connected by technology. All over the world, people actually overestimate our connectedness. We are not all on Facebook and not everyone has a smartphone. On these two, Facebook membership and smartphone ownership, people in the Philippines are found to be near the top in terms of overestimating how connected they are by technology. Filipinos think that out of every 100 individuals aged 13 and up, 87 have a Facebook account. That is so far from the actual number, 38. For smartphones, Filipinos have the impression that 86% have smartphones. Once again, this is a gross overestimation. The actual number is only 23%. These wrong perceptions can easily lead us to overestimate the impact of social media in the Philippines. There are other wrong perceptions found among Filipinos like overestimating teen pregnancy and car ownership. Filipinos, however, underestimate their religiosity. Overall, the Philippines ends up as one of the countries with the greatest amount of wrong perceptions. 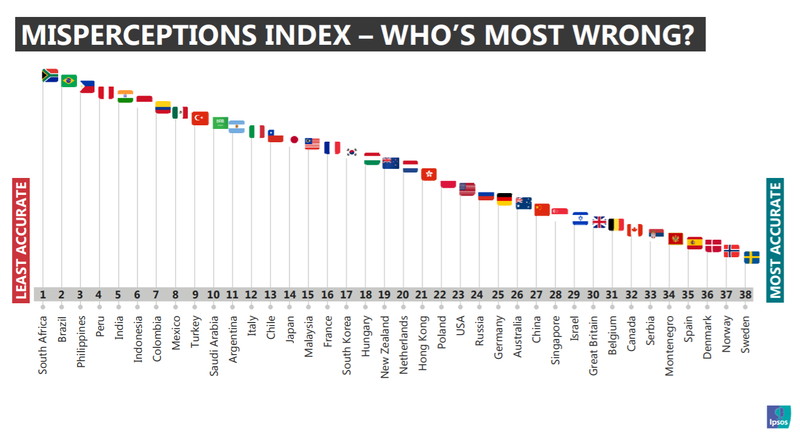 The Philippines ranks near the top in terms of being least accurate. We must really address why we are among the most wrong.